After making quiche last week I had half a bottle of cream left over. Combine that with a recent craving for biscuits and I hoped that cream would make a suitable substitute for buttermilk. Little did I know there was a whole category of cream biscuits. From one of my favorite food blogs to Paula Deen to one of my favorite cookbooks – they all had recipes for cream biscuits. 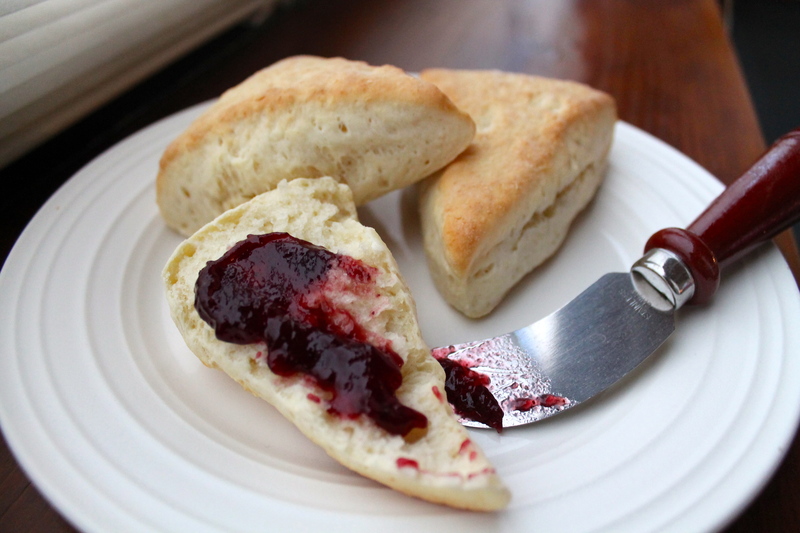 Buttermilk biscuits are more flaky and buttery, whereas these biscuits, are more savory and dense like a scone. As is, they are blank canvases for any flavor you want to add (similar to the pretzels from a couple weeks ago). You could easily stir in fresh herbs, cheese or fruit to add a little punch! Add 1 1/4 cup cream to flour mixture and stir with a wooden spoon until dough forms. Turn dough out onto floured surface and knead for about 30 seconds. If there are floury bits left in the bowl, add remaining cream, 1 tablespoon at a time. Once you’ve created this mixture, add it to the kneaded dough. Yum. I never have cream laying around, but hey, I could get some. The picture looks edible.